A wealthy Toronto developer with close ties to Beijing’s ruling Communist Party has become a donor to federal, provincial and municipal politicians – raising concerns among security experts about the influence he may be wielding in Canadian politics. Ted Jiancheng Zhou, who has condominium projects in China and Canada, has risen to prominence within the Chinese-Canadian community in the Greater Toronto area only five years after his family’s arrival in Canada in 2013. He boasts of connections to high-level Communist Party officials in Fujian province, where he was born. Toronto developer Ted Jiancheng Zhou. The Globe and Mail reported in November that Mr. Zhou, who is a permanent resident, recently set up 10 non-profit organizations aimed at helping the federal Conservatives win support within the Chinese-Canadian community before next year’s general election. The Liberals and New Democrats have asked federal Election Commissioner Yves Côté to investigate the relationship between the Conservative Party and Mr. Zhou’s organizations for possible breaches of election spending laws. Requests from MPs usually trigger an inquiry, former chief electoral officer Jean-Pierre Kingsley said. Mr. Zhou denies his organizations were set up to raise money and help elect Conservatives, saying their purpose is to promote conservative values. In 2016, Mr. Zhou was among the wealthy members of the Chinese community in Canada making the maximum donations to the Liberal Party to attend private cash-for-access dinners with Prime Minister Justin Trudeau. He has since focused at the federal level on the Conservative Party, which under leader Andrew Scheer has drawn the ire of Beijing’s Communist Party by opposing free-trade negotiations with China. The Conservative Leader and 10 other Conservative MPs and senators as well as Ontario Tory MPPs and municipal politicians attended a rally and dinner on Nov. 9 that Mr. Zhou organized for the inauguration of the Federation of Chinese Canadian Conservatives (FCCC), one of the 10 groups he founded, in the Toronto suburb of Richmond Hill. A Globe investigation has found that Mr. Zhou has assisted candidates at all levels of government. Earlier this year, Mr. Zhou was a senior campaign adviser to Ontario Progressive Conservative Vincent Ke, now MPP for Toronto’s Don Valley North riding. Last year, he donated $400 to the Don Valley riding association of Liberal MP Geng Tan in May, 2017, as well as $1,476 to the federal Liberals and $1,028 to the Markham-Unionville Federal Liberal Association in 2015. Only two years after settling here, he also began donating to Ontario provincial politics. Elections Ontario records show close to $3,000 in donations under his name since 2015. Contribution lists from the 2018 municipal elections are not available yet, but financial records show Mr. Zhou donated $500 in 2016 to Ward 21 by-election candidate Jack Wang. The donations to parties and candidates were within the legal limit. The Globe has also learned that Mr. Zhou travelled to China last year with Conservative senators Victor Oh, Don Plett and Leo Housakos and their spouses on an all-expense-paid trip that the Senate ethics watchdog is investigating. The politicians were introduced to senior Chinese Communist Party officials and fêted, including at a lavish dinner at the five-star St. Regis Hotel in Beijing. Mr. Zhou has declined to speak about his Communist Party connections. “This is beginning to seem like a fishing expedition with conspiracy theories,” Mr. Zhou said in a Nov. 16 e-mail to The Globe. In China, Mr. Zhou publicly boasted of ties to powerful people. His Chinese corporate website – now shut down, but accessible through Internet archives – listed 14 current and former political leaders and senior Communist Party officials as references, including members of the Chinese People’s Political Consultative Conference (CPPCC), governors and party bosses in Fujian province, where Mr. Zhou lived before moving to Canada. This roster of notables – to whom Mr. Zhou implied he was connected – was headlined “With cares from leaders,” suggesting these elite Chinese supported his business. 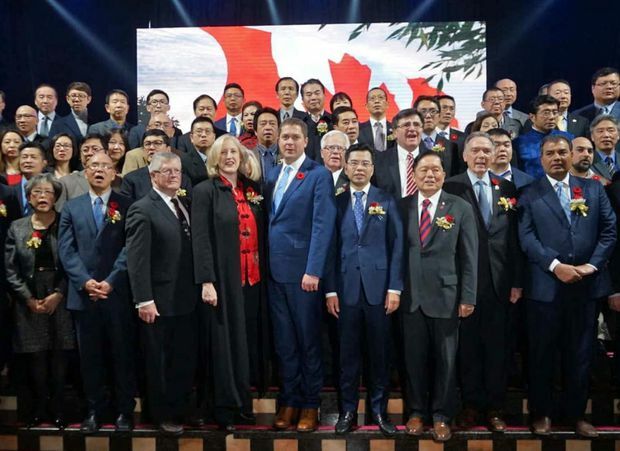 Developer and donor Ted Jiancheng Zhou stands in the front row beside Conservative Party of Canada Leader Andrew Scheer. Among the top officials cited was Lu Zhangong, a former governor and Communist Party secretary of Fujian province, who is now vice-chair of the CPPCC, a political advisory body that falls under China’s United Front Works Department. Another prominent official named as a reference of Mr. Zhou was Zhang Xiefei, the former head of the United Front in Fujian. Before moving to Canada, Mr. Zhou was a member of the Sixth Chinese People’s Political Consultative Conference of Zhenjiang City. Membership is prized because it guarantees VIP treatment at airports and access to senior Communist Party officials. Richard Fadden, a former director of the Canadian Security Intelligence Service, told The Globe Mr. Zhou’s connections to Chinese Communist Party organizations are troubling and suggested he could be used to help promote Beijing’s agenda. “The fact that he is involving himself in three levels of government and supporting all three levels − I mean, who does that,” said Mr. Fadden, who was also a national security adviser to Prime Minister Justin Trudeau and Stephen Harper. Last year, the vice-president of the Fujian Federation of Returned Overseas Chinese, Xie Xiaojian, spoke at a dinner of the Putian-Xianyou Association of Canada, a group whose directors include Mr. Zhou and that uses his corporate office as its registered address. The federation reports to China’s United Front, a high-level organization whose aim is to “co-opt and neutralize sources of potential opposition to the policies and authority of the ruling Chinese Communist Party,” according to the U.S.-China Economic and Security Review Commission, a congressional watchdog group. Chinese-Canadian media in Canada have also reported that Mr. Zhou is the honorary chair of the Federation of Chinese Canadians for the Promotion of Chinese National Reunification, which supports Beijing’s agenda of winning overseas support for bringing self-ruled Taiwan back under China’s control. Last year, Mr. Zhou spoke to the Chinese Canadians for China’s Unification in Toronto. Both organizations have ties to the United Front. Mr. Zhou has since declined to respond to questions from The Globe about his political activities in Canada and relationship to senior Communist Party officials in China. Mr. Zhou says he has 27 Chinese companies, including Shanghai Oriental Capital Group, that generate annual revenue of $2.6-billion. The Globe was unable to independently determine if most of the companies he listed exist. Before he switched his support to the Conservatives, Mr. Zhou attended a fundraiser for Mr. Trudeau in 2016 at the mansion of a Chinese-Canadian businessman where Chinese billionaire and CPPCC member Zhang Bin was introduced to the Prime Minister. A month later, Mr. Bin and fellow billionaire Niu Gensheng announced a donation of $1-million to the Pierre Elliott Trudeau Foundation and the University of Montreal Law School, including $50,000 for a statue of the Prime Minister’s late father. "While there is nothing nefarious about immigrants immersing themselves in the politics of their new homeland, the previously prominent positions these men occupied and their ties to China-based people and organizations which advocate for China’s interests abroad certainly raise the possibility that the United Front Works Department is either directing or capitalizing upon this emigration trend,” said Mr. Campbell, a professor of political science at Brigham Young University. Senator Oh is one of Mr. Zhou’s closest political associates. The two have not only travelled together to China, but were part of a group, including Mr. Tan, the Liberal MP, who attended a farewell dinner in April for China’s departing Toronto consul-general, He Wei. Chinese-language media said last year that Mr. Oh also organized a farewell dinner for China’s departing Toronto deputy consul-general, Xu Wei, and to welcome his replacement Zhuang Yaodong, and Mr. Zhou was there as president of the Canada China Economic Trade and Cultural Exchange Promotion Alliance. Mr. Oh was to become chair of the advisory group of the conservative federation Mr. Zhou recently set up, but the senator withdrew after inquiries from The Globe. Mr. Oh has lent his support to Mr. Zhou’s business ventures, taking part in a July, 2017, groundbreaking ceremony for the businessman’s luxury condominium project in Niagara Falls, Ont. In a corporate video prepared for Mr. Zhou’s Evertrust Development Group, Mr. Oh lauds the project and joins his friend and local Niagara municipal politicians with a shovel and white hard hat at the sod turning. The senator’s office had no comment when asked why he would endorse an upscale condominium project and whether he might be in a business relationship with Mr. Zhou. In April, 2017, Mr. Zhou joined Mr. Oh, Mr. Plett and Mr. Housakos on a two-week trip to Beijing and Fujian Province – at the invitation of a Beijing wealth-management firm that opened an office in Vancouver. The trip was not disclosed to the Senate Ethics Office as either sponsored travel or a gift. The ethics office is investigating. Mr. Oh, who says his sister paid for the senators’ trip, did not respond to questions on whether Mr. Zhou paid any of their expenses. Mr. Zhou was on the trip as a member of the Canada-Fujian business delegation.